Pygmy shrew Sorex minutus, photographed by Pavluvčík. Sorex, the long-tailed shrews, is a genus found in most of the temperate and Arctic regions of the Northern Hemisphere, predominately in moist habitats (Nowak 1999). 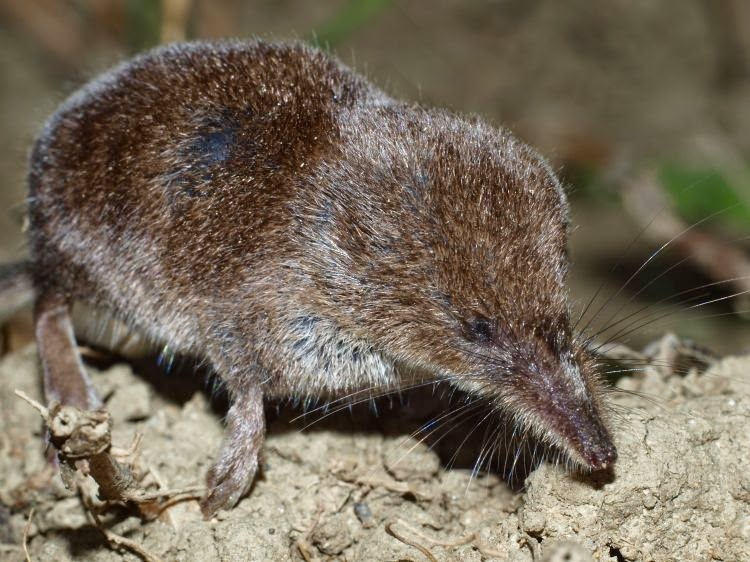 The common shrew Sorex araneus is widespread in northern Europe and northwestern Asia. Characters (from Nowak 1999): Head and body length 46-100 mm, tail length 25-82 mm, adult weight 2.1-18.0 g. Tail a third to more than half of total length, hairy in the young, naked in old adults. Fur sleek; pelage uni-, bi- or tricoloured, colours varying from tan to black. Body slender; snout long, slender, highly movable, with conspicuous vibrissae. Eyes minute but visible; ears usually projecting slightly above pelage. Five upper unicuspid teeth present, with tips coloured brownish to purplish. Females with three or four pairs of mammae. [FK55] Felten, H., & C. König. 1955. Einige Säugetiere aus dem Zentralmassiv, Südfrankreich. Senckenbergiana Biologica 36: 267–269. [KJ08] Krämer, M. & M. Jentzsch. 2008. Kleinsäuger-Vorkommen aus dem Raum Zeitz—eine vergleichende Studie. Mauritiana 20 (2): 411–427. [MB86] Matson, J. O. & R. H. Baker. 1986. Mammals of Zacatecas. Special Publications, Museum of Texas Tech University 24: 1–88. Nowak, R. M. 1999. Walker's Mammals of the World, 6th ed., vol. 1. John Hopkins University Press. [T66] Tristram, H. B. 1866. Report on the mammals of Palestine. Proceedings of the Zoological Society of London 1866: 84–93.